The oldest part is the south arcade of c1200; the north one is mid-C13. In the C14 the nave was extended to the east and the tower, south aisle and chancel are C15 – the last built in the 1490s. The south chapel of c1530 has flamboyant tracery. The village of Brede stands on a ridge overlooking the valley of the river with which it shares a name. The most prominent building is the church, which has a long low outline that recalls churches of the same period in the Low Countries. Though the exterior looks all C15 and early C16, it conceals a more complex development. Earliest are the western three bays of the south arcade of c1200. There are two sections, separated by a short piece of wall, which may have belonged to an earlier aisleless nave; the dimensions of the western part of the nave may remain from this. The single west bay has square responds with attached shafts (cut away lower down), for the inner order of the pointed head. Both orders have chamfers, slight on the outer one. The adjacent abacus of an arch that would have extended across the aisle before it was rebuilt in the C15 could suggest there was a south west tower. The two arches further to the east resemble the western one but broader, with a circular pier and matching responds. The aisle behind would then have been relatively narrow with a lean-to roof. Similar dimensions remain in the mid-C13 north aisle, which was never widened. Its date is shown by a west lancet, whilst the three-bay arcade has octagonal piers and responds and double-chamfered heads of standard pattern. Pevsner dated it as late as c1300 (BE p422), but a mid-C13 date is preferable. 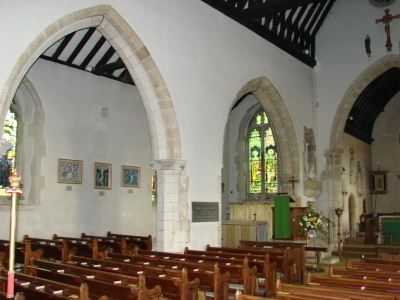 East of both arcades are further pieces of wall, followed by single arches, generally similar to the north arcade, and the broad chancel arch. Their wider chamfers, separated by little more than a groove, and flattened responds are certainly C14. Above the arch to the north is the upper entrance to the roodloft, which is probably contemporary. This work suggests the nave was extended eastwards by a bay with, presumably, a new chancel beyond. Possibly the arches led to transept chapels rather than extensions of the aisles (1 p123), but it seems unlikely on the north side at least that had there been such a chapel, it should have been replaced in the C15 by a narrower aisle, reverting to the C13 dimensions. Moreover, there is no sign of a join in the walling. Any older work on the south side would have been replaced when in the C15 the entire aisle was rebuilt. The north doorway with two moulded orders is C14. Construction of the present broad, gabled south aisle in the earlier C15 would have required the removal of the presumed south west tower and its replacement by the present west one. This has a semi-octagonal north east stair-turret, diagonal buttresses, a pointed and moulded west doorway and a four-light window. Above single trefoiled openings are double bell-openings and battlements around a tiled pyramid. The tower arch has three orders, continuous except for the inner one, which is shafted. The first of two Sharpe Collection drawings (c1797) shows there has been little change to the south aisle, despite C19 restoration. As then, it has two-light square-headed and tall pointed windows, the latter with panelled tracery. A square-headed one is squeezed in over the porch; two further east have more space above. Some old timbers in the porch show the structure is C15, as is part of the restored moulded four-centred doorway. The moulded tiebeams and other timbers of the south aisle roof (and one tie in the north aisle) and much of the nave roof are also C15. The north aisle was remodelled at the same time and all windows but the west lancet were replaced with pointed ones with panelled tracery. The concentration of earlier C15 work in the western parts supports the conclusion that the chancel had been adequately altered or rebuilt in the C14. However, in the late C15 it was remodelled, with bequests by members of the Oxenbridge family in 1493 and 1496 (SRS 41 p200). The second of these was specifically ‘for the glassing of his [the parson’s] chauncell’, suggesting that the work was largely finished. The north side seems always to have been blank except for a small doorway now opening into a vestry. The windows are pointed; previously the east window had panelled tracery, but this was altered in the C19. The second Sharpe Collection drawing (1806) shows it with three elongated quatrefoils in the head. 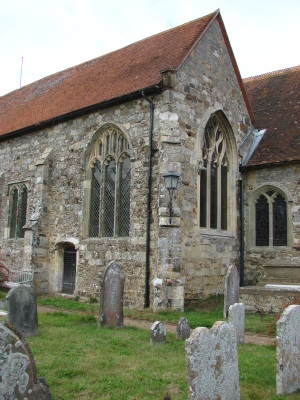 The Oxenbridge family also built the south east chapel of the chancel for the tomb of Sir Goddard Oxenbridge (d1531) (see below). It keeps the proportions of the aisle and accentuates the length of the church when seen from this side. The south window, which is like the large aisle windows, may be the former east window of the aisle reset. The present east window has flamboyant tracery, which is renewed, but probably accurate. It is a further recollection of work of the period in France and Flanders, which had close links with Sussex. Each light has an exaggerated ogee head and the hoodmould comes down low at the sides, with downward pointing grotesque animal-stops. Stephen Hart (Medieval Church Window Tracery p108) suggests that its form may not be original and may date from 1667, a date found on adjacent lead flashing. However, this overlooks other instances of such work nearby in both Kent and Sussex (for further details see under East Guldeford). A south doorway has a depressed moulded head and an angel and a wyvern as stops on the label. The arch of two orders between chapel and chancel has semi-octagonal responds with narrow capitals with foliage and flowers. 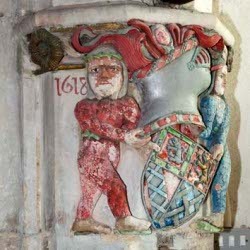 On the east one, beneath a helm with vigorously carved supporters, is a shield bearing the arms of Oxenbridge, quartered with Hopton, Ore and Etchingham (VCH 9 p169). This bears the date 1618 and is therefore a later addition, though the ownership of the chapel did not change. 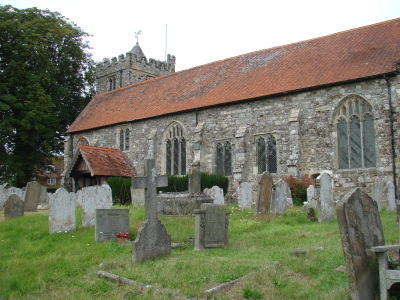 The church around 1800 had changed little since the Oxenbridge chapel was added. At the restoration of 1867-68 by H F Price (B 26 p286), most stonework was renewed, but except the east window, the work seems to have been accurate. The tracery of the previously bricked up west window of the tower was replaced on the basis of fragments found (ibid). Price uncovered the chancel roof and though he claimed to have replaced the nave roof, several old timbers show that this was not literally so. Similarly, though he is said to have repaired the south aisle roof using the best old timbers he found, there is little obvious new work. The restoration is said to have cost £1600 (KD 1899). In 1890 J Fowler (CDK 1890 pt 2 p156) did further work on the tower at a cost of £300 (KD 1899). Despite an ambiguous statement that he added a ringing chamber (CDK ibid), there is no sign that it was heightened and the budget seems too low in any case, so the chamber must have been within the existing fabric. 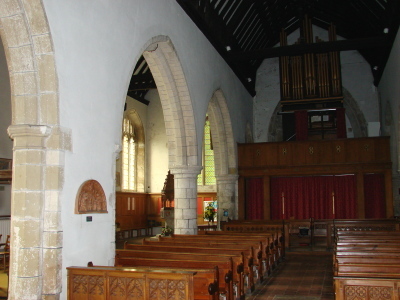 He also restored the south porch and raised the chancel floor. In 1928 C Hare refitted the Oxenbridge chapel and removed the organ (ESRO Par 253/4/1-6) to a new west gallery; a disadvantage of this arrangement is that the west end, including both arcades, is obscured. Alms box: (South aisle) Free-standing, consisting of an iron box standing on a pillar, dated 1687. Aumbry: (North chancel) Plain and pointed but certainly late C15. Bracket: (Oxenbridge chapel, close to screen) Reset C13, decorated with dogtooth. Brass: (Oxenbridge chapel) Robert Oxenbridge (d1482) and his wife Anne (d1493). Only a leg and both feet of the former remain. Originally on the floor, they were mounted on wood and let into the back of an unrelated late C15 tomb (see below) by Hare in 1928 (Meads). Carving: (Adjacent to south arcade) Tall wooden Madonna by C Sheridan, 1941 (B Taylor p16), in memory of her son. Chest: Scandinavian, dated 1633 with deeply carved figures on the sides and top (not on display in 2011). Cradle: C17 and said to have been used by Jonathan Swift (Mee p53). It was presented in 1895 (not on display 2011). Font: C15 with an octagonal bowl on which shields and arched panels alternate. The painting on the shields is not old. 1. (Window above south porch and east window of south chapel) C15 fragments, said (Horsfield I p515) to come from the west window. There are several complete figures in clear and yellow glass, together with a head of a bishop, which may be C16. 2. (South chapel east window) Heraldic glass, possibly C17, though one piece bears the date 1840. 3. (East window, west window and two chancel north windows) M O’Connor, 1868 (B 26 ibid; the north one is signed). The west window is of geometric glass and largely hidden by the organ. 4. (South chancel) A Gibbs, c1876 (signed). 5. (North aisle west window) W Warrington and Co, 1886. 6. (North aisle east and first windows) Given to W Warrington (CT 10 May 1895) (i e the firm he founded), 1895 and undated, respectively (the north east one is signed with the address ’70 Albion Street, Leeds’ the earliest recorded use of this, the company’s final address. 7. (North aisle, second window) Heaton, Butler and Bayne, 1908 (ESRO Par 253/4/1-6). 8. (North aisle, third window) Two lights by ‘Miss H Cook‘, 1926 (www.stainedglassrecords.org retrieved on 4/2/2013). Though the person commemorated died in 1906, the style with irregularly shaped pieces of glass and bright colours is consistent with the later date. 1. (Oxenbridge chapel) Sir Goddard Oxenbridge. 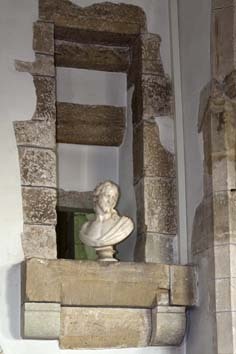 He died in 1531, but the tomb was erected in 1537, the date on the wall behind. His armoured effigy lies on a tomb-chest, its head on a helm. The detail of the monument is renaissance not gothic and the sides of the chest are decorated with heraldry. 2. (Oxenbridge chapel) Late C15 tomb with a flat crested arch, restored shields and quatrefoils on the chest. It probably commemorates a member of the family. 3. (North chancel) Felicia Elizabeth Hele (d1829) by M W Johnson (Roscoe p670). A sorrowing draped woman leaning on an urn. 4. (North chancel) Robert Hele Selby Hele (1839?) by M W Johnson (ibid p671). This is broadly similar to the last, but the arrangement of the design is more vertical. 5. Bust of Clare Sheridan (see above) by Sir J Epstein (not on display 2011). Paintings: (Stations of the Cross) Painted in varying greys by Sir T Monnington and started in 1959 (Fine Arts Society publication p64). Pantiles: The floors of the nave and aisles are largely covered with pantiles, which could date from the building of the church or soon after. Piscina: (South chancel) Plain and pointed; from its position it is late C15. Screen: (Between Oxenbridge chapel and aisle) Much restored C15, the survivor of those at the east ends of both aisles, noted by Sir Stephen Glynne in (? )1826 (SNQ 16 (May 1965) p164). Each division is traceried. Sedile: (South chancel) The window sill has been lowered to form a seat. My thanks to Nick Wiseman for the photographs of the capital and the bust.